Mitsuko Uchida is regarded as a great, almost revered interpreter of Mozart's piano concertos . . . her ensemble playing is as impeccable as you'd expect . . . [in the allegretto and presto finale of the C major concerto] her playing is electrifying and full of feeling. It's a worthy addition to any collection, and flawless like all its predecessors.
. . . [Uchida brings to these two concertos] a sense of opera buffa comedy in the outer movements and a singing cantabile in the andantes that have always been her hallmarks . . . she tends to linger lovingly in the slow movements, enjoying her civilised discourse with the outstanding Cleveland winds . . . she captures perfectly the Figaro fun of, especially, the C major with its near quotes, and the variation finale of the G major, with its dramatic comic-opera changes of tone and tempo. The cadenzas are Mozart's, and the entire performances emblematic of a player who has devoted the best part of her life to his music.
. . . a compelling addition to the Mozart discography . . . [the Concerto no. 17 K. 453] is particularly alluring: details are uncovered as if for the first time . . . and the wind players are in particularly fine fettle . . . As accompanist, Uchida is the most generous of colleagues, withdrawing her sound to a whisper. By contrast, the cadenzas (Mozart's own) are wondrously shaded, and in that of the slow movement she plumbs the depths before drawing to an ethereal close of considerable beauty . . . [the lustrous slow movement is more elegiac and] we as listeners privy to the most intimate of conversations . . . Uchida and co find so much of interest in the following variations here that you're constantly engaged. The interplay between soloist and orchestra is particularly sparky and the Presto conclusion provides a true contrast, thrillingly upbeat yet never merely breathless. No question, this is up there with my favourite performances of K453 . . . [Mozart 25]: the opening tutti has a Beethovenian strength to it, brilliantly punctured by Uchida's gleefully understated entry . . . The Cleveland are particularly responsive in the finale, which opens with such unassuming grace before exploring darker landscapes; in the middle section Uchida's duet with oboe then flute has a wonderfully rhapsodic quality. If you're already collecting this series, you'll need no encouragement from me. But for K453 in particular, this is a winner. Her virtues marry the range or colours on offer from a concert grand with a classical purity -- precision, restraint, inward expressiveness, topped with the occasional meticulous decoration.
. . . Uchida's interpretation exceeds the sum of its parts. Her tone is famously pearly. She draws out the music's lyrical writing without ever forcing things. And she's in no hurry to get through these pieces. But she shapes every phrase impeccably. Her rhythm is precise. Each run of sixteenth notes (or eight notes or thirty-second notes) is articulated with driving energy. Textures are balanced with pristine clarity. There's lots of brain in it, to be sure. But there's more heart. In a word, her playing is irresistible . . . Throughout, the Cleveland Orchestra accompanies Uchida with perfectly-matched energy and color. Both concerti offer ample woodwind solos, and there's some particularly fine playing from principal flute Joshua Smith and principal oboe Frank Rosenwein.
. . . the clarity and fluidity of ensemble remains undeniable . . . Uchida has a happily "singing" concept of Mozart's keyboard style, and so the development section of the "G Major Concerto" first movement assumes a luxurious patina with the piano's upward rocket figures and within the interplay with the Cleveland wind section . . . [Mozart 25 K. 503 / 1st movement]: At moments, Uchida's sonority plays "alla musette", adding an especially delicate color to an otherwise majestic pageant and panoply of ideas. In her thirties, Uchida already showed a mature grasp of Mozartian style, structure, and phrasing . . . Her playing is now, if anything, even richer than before, with emotions more deeply expressed . . . Mozart's concertos in G major K453 and C major K503 benefit from the presence of a great Mozartian on the podium . . . Uchida's achievement deserves a place of honour alongside Goode, Kocsis and Ashkenazy . . . I find it ravishing. It has everything that Mozart, most searching of composers, demands, and just as important, nothing that he doesn't . . . Clearly she loves every note, and loves them even more now than 30 years ago, but that doesn't lead to unnecessary dwelling on them, or pulling around the phrases, or any of the other lapses . . . The Cleveland Orchestra interacts with their great soloist to the utmost, as if they were members of a long-lasting chamber group, and the playing of the woodwind is so marvellous that you wish you could re-run what you've just heard and play it again. Perfection of its kind.
. . . Civilized Mozart-Beauty . . . Mitsuko Uchida's latest release in her ongoing Mozart Piano Concerto cycle is so artless, so sunny, it sounds like a Sunday afternoon with the family; a world where all's right: The Golden Retriever happily bounces around the yard, the kids brought home straight A's on their geography tests, and mother-in-law baked everyone's favorite cake . . . Uchida and her Clevelanders flow from movement to movement with the greatest natural ease. The orchestra, conducted from the keyboard, plays with chamber-like assurance and great sensitivity, adding greatly to this wholesome delight. Was soll man da noch sagen? 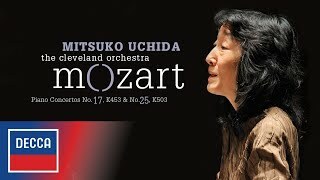 Mitsuko Uchida, ihre Freunde vom Cleveland Orchestra und Wolfgang Amadeus Mozart sind für sich bereits ein Erlebnis, als Triumvirat werden sie zum klanglichen Ereignis. Aber kein aufdringliches Ereignis, sondern vielmehr als gemeinsames Spiel mit der Feinheit gelingt die vorliegende Aufnahme, bei der der gemeinsame Genuss aus einem Guss immer hörbar ist . . . Intellektuelle Frische zeichnet ihren Mozart bereits legendär aus, mit Esprit schwingt sie sich auch hier durch das berühmte G-Dur Konzert KV 453. Und durch die mindestens genauso berühmten Original-Kadenzen: Vom Klavier aus macht Uchida nach schöner Tradition des dirigierenden Virtuosen das Orchester zum kongenialen Partner. Das ebenso populäre C-Dur 25er Konzert KV 503 besticht durch Klarheit -- etwa im majestätisch genialen Eröffnungsallegro, vollkommen unprätentiös der großen, strahlenden Linie ergeben. Das G-Dur-Konzert KV 453 kommt einer Offenbarung gleich. Wie sie mit Sensibilität und Feingefühl jede noch so kleine Nuance ausleuchtet, ganz nach innen gewandt den Tönen nachzulauschen scheint, aber dennoch Intensität und Spannung bis zum Äußersten treibt, ist faszinierend.
. . . [dans le Concerto no. 17] le jeu assez doux . . . la sérénité de l'interprétation conduit à quelques passages somptueux. Le mouvement lent, particulièrement élégiaque, offre un beau moment de quiétude automnale, tandis que le finale, abordé sans hâte mais sans lourdeur non plus, permet de déguster la pétulance du thème et les subtils jeux de timbres . . . Dans le grand spectacle du Concerto no. 25, on apprécie le contraste entre la solennité des musiciens de Cleveland et le jeu brillant et perlé de la soliste . . . dans le finale, qui s'échauffe progressivement, le gracieux dialogue entre le clavier et les vents renforce l'intérêt de cet enregistrement . . .